The Encompass Rise & Thrive Breakfast is an annual event that features an engaging keynote speaker complemented by a delicious breakfast, and will bring together over 250 community leaders, educators, local businesses, and parents to help engage in our vision to create a community where ALL children thrive. 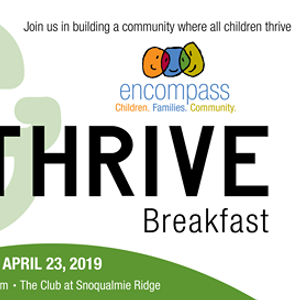 There is no financial commitment or ticket fee required to attend – just our hope that you will consider making a pledge of $100 or more at the conclusion of the breakfast program, in support of Encompass and the vital programs & services we offer to local children and families. Encompass needs your support & leadership in helping to promote this unique event across the Snoqualmie Valley. Please help us spread the word by inviting your friends, family, neighbors, and co-workers to join us at the Rise & Thrive Breakfast!